Designed as a portable power generator to power up multiple items for car traveling and home using. As a backup , it is ideal for power failure emergencies.It can always generate the power whenever and wherever you need it . 1. Low Interference - Delivers ultra clean Pure Sine Wave Power which is as same as the AC grid power supplied by your utility. Improves AC equipment performance with low interference technology, Good choice for television, stereo ect. Ideal for sensitive loads like instruments with high accuracy. 2.Low idle power draw - reduce the loss of the circuit and Improve the efficiency of electrical appliances. 3. off grid application - Ideal for emergency use as long as you get your battery fully charged. You can make your own electricity for your house wherever there is power outage or cut-off. 4.Dual US AC outlets and LED Digital Display - power different devices at the same time with no issues and monitor the voltage changes at any time . 5.Easy operation - Easily moved to different units with quick connects.It can be used in the solar and wind system as well. Get your battery charged by solar panel with the solar charge controller. just plug and play. 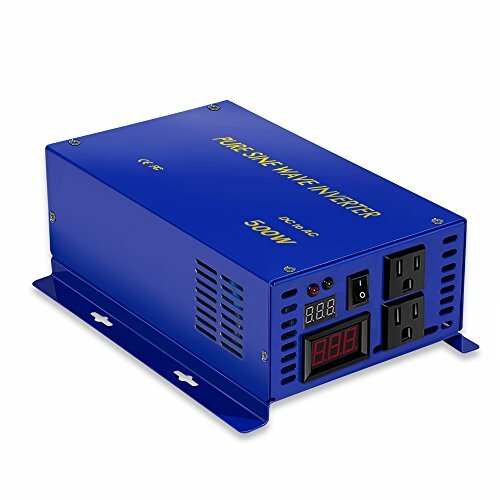 PACKAGE CONTAINS: 1x 500W Power Inverter, 1x set of battery cables, 1xUser Manual, Several fuses, our 24-month warranty and 100% customer service. Converts DC 24V to AC 110V 120V household power with continuous 500Watts outputs and surge power of 1000W ,60Hz frequency .With 2 AC receptacles, Big and clear MCU LED Display for DC Volt and AC Volt output to moniter the actual working status. performs perfectly for camping, RV ,truck ,car,solar or Household. It's easy to connect your car cigarette light plug or battery clamps with the car battery to bring the power supply for your laptop, digital cameras, fans, game consoles, GPS, lamps and other electronics. Quality guaranteed with advanced programmed software and rational hardware design with branded big MOSFET, capacitor, volt transformers ect. Most advanced technology in software and hardware design with 10 years production experience in pure sine wave inverter. MCU (Microprogrammed Control Unit) as data process. Manufacturer: Wenzhou Qisan Energy Technology Co.,Ltd. Publisher: Wenzhou Qisan Energy Technology Co.,Ltd. Studio: Wenzhou Qisan Energy Technology Co.,Ltd.